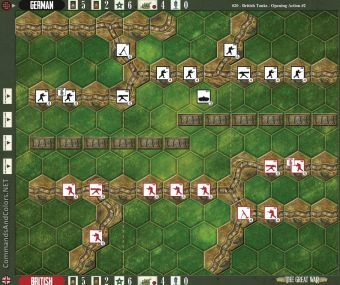 The Command and Colours WWI THE GREAT WAR game rules allow players to portray important engagements throughout WWI history. The battles, in the scenario section, focus on the historical deployment of forces and important terrain features in scale with the game system. The scale of the game is flexible and varies from battle to battle. For some scenarios, a few infantry units may represent an entire wing of a larger battle, while in other scenarios a unit may represent just a few brave soldiers going over the top. 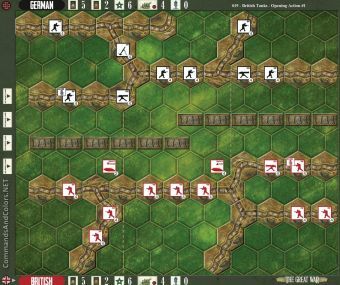 The Command card system drives movement, creates a “fog of war” and presents players with many interesting opportunities; while the battle dice resolve combat quickly and efficiently. The Combat cards add an element of suspense and will challenge players to coordinate their use in a timely manner. Overall, the battlefield tactics players will need to execute to gain victory conform remarkably well to the strengths and limitations of the various types of WWI units, their weapons, battlefield terrain, and written history. In this first expansion for THE GREAT WAR, we focus on battles involving WWI Tanks. Although the performance of the first WWI tanks, Little Willie/Mark I, proved disappointing in battle, British supporters of this new battlefield weapon remained convinced that the use of these cumbersome machines could win the war. Nonetheless, the first appearance of tanks caused considerable alarm to the Germans. By 1917, the new Mark IV tank was ready for battle and featured many improvements, which made the tank more reliable. A number of the scenarios in this expansion feature Byng’s Third Army, in Autumn of 1917, putting these new assets to use to launch a limited and tactically radical attack at Cambrai. Following a surprise hurricane artillery bombardment, 378 British tanks smashed through the Hindenburg Line, temporarily creating a rupture to the German lines and gaining a chance for a major breakthrough. Mobile reserves were not brought forward in time to exploit the tanks’ success and within days the opportunity of success was lost. However, Cambrai did proved to be a key learning experience for the British command. 1917 also saw the introduction of a lighter tank, nicknamed the Whippet, which was faster than previous tanks and in July 1918 the Mark V tank became available. Although German High Command still expressed its contempt for the new battlefield weapon, judging a tank to be of little use and having no future, also introduced their own Super Heavy A7V tank in 1918. Through the war years, modifications and improvements to the British tank force were constantly being countered as the Germans developed tactics and armament to defend against each new version. In retrospect, the Tanks of 1916-1918 were not war-winners, but they were a vital stepping stone in the development of battlefield tactics which were not fully implemented until 1939 and 1940 and exemplified in the blitzkrieg tactics of the German army in 1940. Notice: This product is an expansion for THE GREAT WAR board game. NOT A STAND-ALONE GAME. An original copy of THE GREAT WAR is required to play.